The Special of The Day...From the Orange Moon Cafe: "An Emotional Reaction"
I'm pretty sure it's all I have left of him. 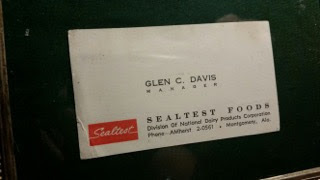 We have pictures of my father, of course, but as far as I know, this old business card survives as my dad's last remaining possession. He passed away in 1959, when I was two years old. I have little direct memory of him, if any. I'm sure he is with me, however, in heritage and also in influence from the precious little time we had together. I've been told by family members that I'm like my father in personality, and I know that his absence from my life greatly affected me as a child and adolescent, and perhaps still does as an adult. I showed the business card to a friend yesterday, and surprisingly to myself, experienced a strong emotional reaction as I mentioned that the card is all we have left of my father. I was surprised by my response because I've lived most of my life without him. I don't feel as if I really knew my dad. This led me to think of an infinitely greater emotional response by a Son who also experienced separation from His Father. "My God, My God, why hast Thou forsaken Me?!" (Matthew 27:46). We will never know the depth of agony and sorrow known by the Lord Jesus Christ when for our sakes, He experienced wrath and abandonment from His Father. Rather than the love He had forever known in the eternal past, our Savior bore the judgment of God as He died for our sins on the cross of Calvary. "We did esteem Him stricken, smitten of God, and afflicted" (Isaiah 53:4). Consider this dark statement in light of the Lord's affirmation to His Father uttered just before He suffered: "Thou lovedst Me before the foundation of the world" (John 17:24). From infinite devotion, affection, commitment, and communion to the cumulative wrath of God executed against the aggregate sins of humanity, the Lord Jesus suffered beyond measure: "He is the propitiation for our sins, and not for ours only, but for the sins of the whole world" (John 17:24). No contemplation of this emotional reaction will ever begin to plumb the depths of the lonely and brokenhearted sorrow known by the Son of God when He suffered the Divine rejection that should have been ours. While surprised by my response regarding my father, I was nevertheless glad it happened. It revealed a bond that even death could not sever. I am glad also that it led me to consider the bond that was severed, for our sakes. I am grateful, as I know you are, and on this Father's Day, we do well to remember a Father and a Son who willingly experienced a breach in their relationship in order to establish eternal and unbreakable relationship with us. Yes, to the degree that the Lord Jesus Christ was forsaken on the cross of Calvary by His Father, God's trusting children will never be forsaken by that same Father. "I will never leave thee, nor forsake thee" (Hebrews 13:5). This is a good day to remember such wondrous grace, as is every day.